Metal detecting accessories & detectors for those who love treasure hunting! Great prices on the best brands like XP, Fisher, Garrett, Teknetics, Grey Ghost, and more. Skip to Metal Detector Category Links. From Detectorists With Actual Experience! 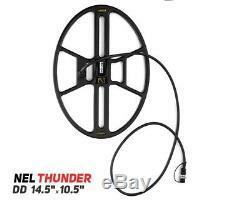 This NEL Thunder Coil Fits The Garrett AT MAX Only! Coil Thunder is the latest development that combines high levels of detection depth and selectivity. Working with a slow swing will maximize its ability in finding not only large and medium targets but small targets which weigh less than 1g at 20 cm deep as well. Coil is suited for finding coins, treasures and artifacts in the field of military battles in any territory. The coil is fully submersible, body is filled with epoxy resin and additionally has a black protective coating that is used for the protection of marine boats, and it makes it possible to use the coil without coil cover. The coil copes excellently with high and medium soil salinity. 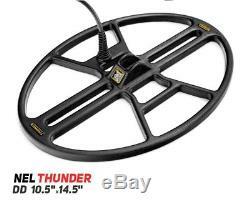 The item "NEL Thunder Coil For Garrett AT MAX Metal Detector" is in sale since Friday, June 8, 2018. This item is in the category "Business & Industrial\Test, Measurement & Inspection\Test Meters & Detectors\Metal Detectors". The seller is "treasuremtnmetaldetectors" and is located in Mount Juliet, Tennessee. This item can be shipped to United States.